6.3 What if ... what then? modernen Medizin, die den bekannten drei bis vier physikalischen Aggregatzuständen entsprechen. aus der impliziten Ordnung (nach David Bohm) oder dem Urgrund des Seins (Tao). Anmerkung: Die explizite Ordnung steht für die begrenzte, sinnlich wahrnehmbare Welt der Realität. Die implizite Ordnung steht für die unbegrenzte Welt des Möglichen, aus der heraus sich die Wirklichkeit manifestiert. pflanzen drüben wir den Schicksalsbaum. halt das Lichtlein fest, das Gott entfacht! Jeder ist sein Fluch und ist sein Segen! Wohl dem Geist, der unablässig wacht. Jung beschreibt eine bahnbrechende Entdeckung aus der Beobachtung von Traumserien aus bis zu mehreren Hundert Träumen eines Klienten. There are dreams that are produced by conditions of the digestive system. There are the relations of the mental with those of the spiritual condition. 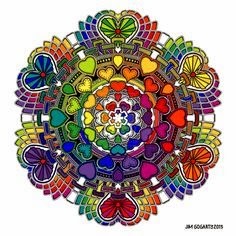 Then there is the mental condition of the body wherein worry, trouble, or any unusual action of the mind-mentally-physically – causes seeking for the way and manner of understanding. [T]he idea that dreamless sleep is an unconscious state is not well-supported by the evidence. This is not to claim that conscious mental activity continues throughout sleep. 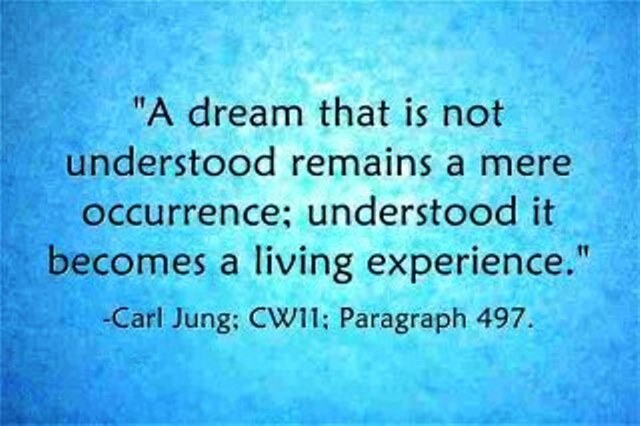 Whether periods of unconsciousness occur in sleep alongside dreaming and dreamless sleep experience is, in our view, an open empirical question. The more pressing point is that, given the available evidence, it seems unlikely that all stages of sleep currently classed as dreamless necessarily or consistently involve a loss of phenomenal consciousness. By embracing your subconscious, you gain a different way of seeing and experiencing – an expanded perception that opens a doorway, not only to lucid dreams, but also to the mythic dimension. Dreaming Emotion-driven During sleep brain scans can track the status of the (very primitive) control center at the back of the brain. In the dream state the amygdala governing fear and emotions is active. Both the prefrontal cortex and the orbital frontal cortex (fact checker) are basically shut off (quiet). The Babylonian king Nebuchadnezzar had a prophetic dream of a gigantic statue made of four metals, from its gold head to its feet of mingled iron and clay; as he watched, a stone "not cut by human hands" destroyed the statue and became a mountain filling the whole world. The Israelite Daniel interpreted a dream of Nebuchadnezzar, king of Babylon. The statue represented four successive kingdoms beginning with Babylon. The stone and mountain signified a kingdom established by God which would never be destroyed nor given to another people. Nebuchadnezzar then acknowledges the supremacy of Daniel's God and raises him to high office in Babylon. The book of which he is the hero divides into two parts, a set of tales in chapters 1-6, and the series of visions in chapters 7-12, the tales no earlier than the Hellenistic period, and the visions from the Maccabean era (the mid-2nd century BCE). Chapter 2 in its present form dates from no earlier than the first decades of the Seleucid empire (late 4th/early 3rd centuries BCE), but its roots may reach back to the fall of Babylon and the rise of the Persian Achaemenid empire. The overall theme of the Book of Daniel is God's sovereignty over history. On the human level Daniel is set against the Babylonian magicians who fail to interpret the king's dream, but the cosmic conflict is between the god of Israel and the false Babylonian gods. What counts is not Daniel's human gifts, nor his education in the arts of divination, but "Divine Wisdom" and the power that belongs to God alone, as Daniel indicates when he urges his companions to seek God's mercy for the interpretation of the king's dreams. Summary In the second year of his reign Nebuchadnezzar, King of Babylon, is troubled by a dream. He summons his magicians and astrologers to interpret it, but demands that they first tell him what the dream was. They protest that no man can do such a thing, and Nebuchadnezzar orders that they all be executed. This decree also falls on Daniel, but he, through the agency of his God, is able to tell the king the dream. It was a dream of a great statue with a head of gold, arms and chest of silver, belly and thighs of bronze, legs of iron, and feet of mingled iron and clay. A great stone, not cut by human hands, fell on the feet of the statue and destroyed it, and the rock became a mountain that filled the whole world. 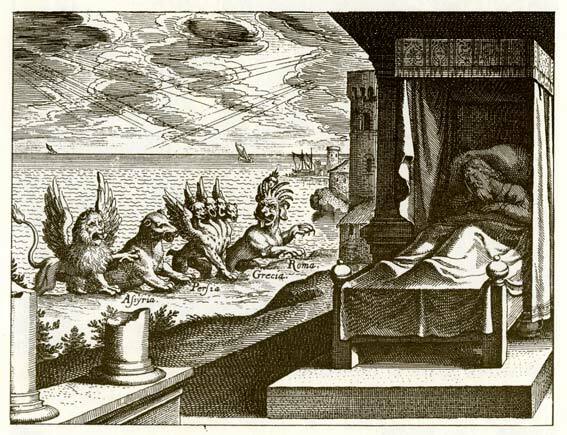 Daniel then interprets the dream: it concerns four successive kingdoms, beginning with Nebuchadnezzar, which will be replaced by the everlasting kingdom of the God of heaven. Nebuchadnezzar affirms that Daniel's god is "the God of gods and Lord of kings and revealer of mysteries." He lavishes gifts on Daniel and makes him chief of all the wise men and ruler over the province of Babylon. What if ... what then? Domhoff, unable to prove that the Senoi did not do community dreamwork at the time described, made 7 logical fallacies. Nichtdeutsche oder im Ausland lebenden Deutsche geben Auskunft über Deutschlands Potential für die Zukunft der Welt. Vor 2600 Jahren dachte der babylonische Herrscher Nebukadnezar des Nachts an die Zukunft. Wie werden seine Nachkommen seinem Reich verfahren? Zu dieser Frage hatte er einen außergewöhnlichen Traum. Aufgewühlt davon, fordert er die Gelehrten und Weisen in der Hauptstadt Babylon auf, seinen Traum zu deuten, vorausgesetzt, sie können ihm auch den Traum selbst erzählen. Sie waren außerstande. Der verschleppte junge Israelit namens Daniel, der später zum biblischen Propheten aufstieg, betete zu Gott und träumte tatsächlich den Traum Nebukadnezars. Obendrein erfuhr er auch dessen Bedeutung: Daniel und Nebukadnezar sahen eine Statue aus den vier Metallen Gold, Silber, Bronze, Eisen. Ihre Füße bestanden aus Eisen und Ton. Deutung: Aus Babylon (Gold) wird das Medo-Persische Reich (Silber) hervorgehen. Danach folgte Griechenland (Bronze), dann Rom (Eisen). Die vier Reiche sind als Raubtiere am Nürnberger Rathaus abgebildet. "Take back the opposites within themselves." Robert Moss: "We don't need a NDE to know the lessons of death. We go to that place in our dreams." Page generated in 1.791 seconds.